A healthy dancer is a happy dancer and, in my eyes, the only way to stay healthy is to stay educated! Dancers, educators and health practitioners are invited to a day of dance health learning at Healthy Dancer Canada’s 6th Annual Conference on Sunday October 6th taking place at the Dancemakers Centre in Toronto, ON. 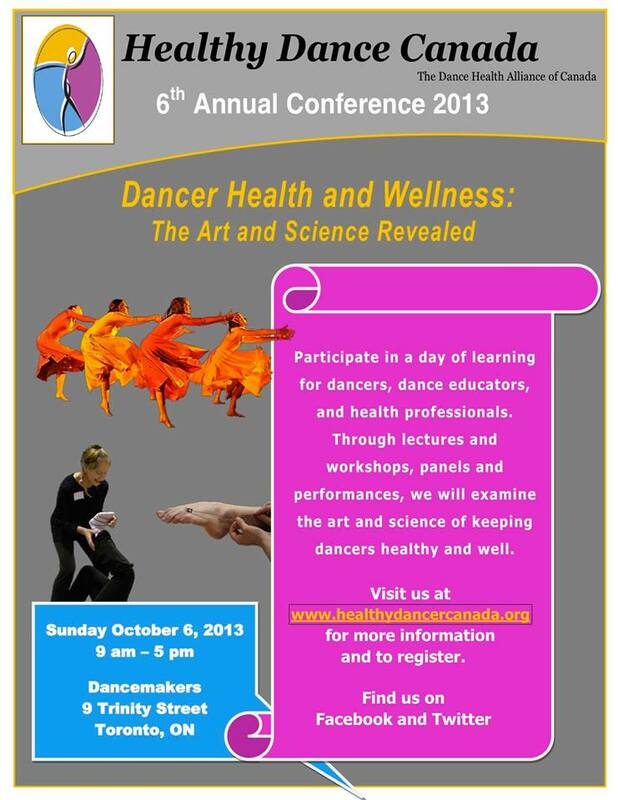 The theme of this year’s conference is Dancer Health and Wellness: the Art and Science Revealed. It is going to be a great day filled with interesting lectures, fun filled workshops, engaging talks, beautiful dancing and probably a bit of an information overload. It is bound to be a fantastic day filled with invaluable information. Healthy Dancer Canada’s mission is to be the Canadian leader in facilitating communication and collaboration between the dance community and health professionals and to enhance the health and well-being of all dancers. I am very proud to be involved with this organization and would love to see more dancers joining me at the event. For more information on the stellar lineup of participants and to register please visit the Healthy Dancer Canada website. I highly suggest you come and join in on the fun!